Modern Custom Fabrication, designed by TETER’s architects and structural engineers, is featured on ABC 30 Action News. FRESNO, Calif. (KFSN) — Modern Custom Fabrication makes giant tanks that hold water, petroleum products, chemicals, and just about any liquid. They ship all over the country and around the world from its 80 year old plant in Downtown Fresno. Because High-Speed Rail will come right through where they are located they have to move, and city leaders are happy they chose a new site in Southeast Fresno. 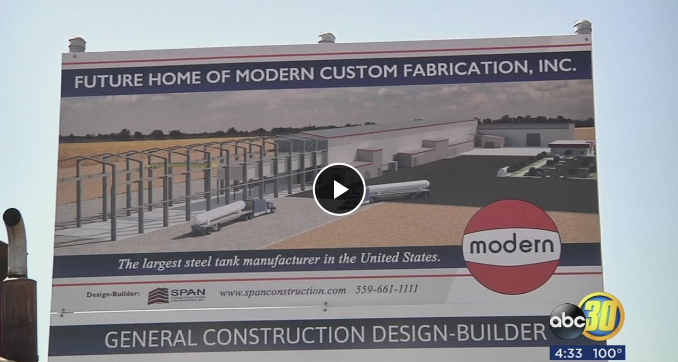 “It’s a pleasure to celebrate Modern Custom Fabrication and their decision to stay and grow in Fresno,” said Fresno Mayor Lee Brand. The city worked with the High-Speed Rail Authority and the Fresno Economic Development Corporation to keep the plant and its 40 employees here. “We wanted to make sure that you kept your jobs, that you were able to stay in the city you love and raised your family in,” said Lee Ann Eager with the Fresno County Economic Development Corporation. The groundbreaking on the new site of the more than 100,000 square foot building came five years after Plant Manager Jim Gray was first told High-Speed Rail is coming through. Eager said companies in the path of High-Speed Rail are given incentives to relocate. The new plant is expected to open in March of next year. “It has turned out okay for us, it’s been a long long process,” said Gray. Big companies like Ok Produce have also moved to new facilities, along with small businesses like Cosmos Restaurant. Many more moves are expected as the pace of High-Speed Rail construction, which is years behind schedule, is starting to pick up. The High-Speed Rail Authority has successfully relocated 178 Fresno businesses so far, and 90-percent have stayed in the city. The rail line connecting the Central Valley to Silicon Valley is expected to be completed in eight years. The eventual connection from San Francisco to LA through Fresno is expected to be about 12 years away.